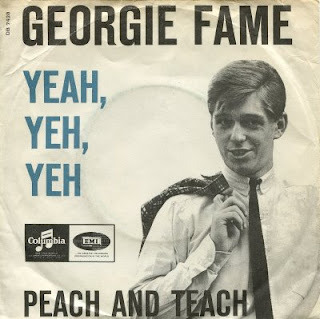 On this day 53 years ago, on January 14, 1965, Georgie Fame hit the top of the British singles chart, displacing the Beatles' "I Feel Fine", with a song that started as a jazz instrumental, "Yeh Yeh". The song started as a pure instrumental by Rodgers Grant and Pat Patrick of Mongo Santamaria's band and recorded on his 1963 album Watermelon Man. Singer Jon Hendricks of Lambert, Hendricks and Ross heard the song and wrote lyrics for it with the trio, now Lambert, Hendricks and Bavan, putting it on their album At Newport '63. Georgie Fame and his band the Blue Flames were regulars at The Flamingo Club in Soho, London and were fans of a number of genres including early Ska and American jazz and blues. Fame signed with Columbia Records in 1963 and released their debut album, Rhythm and Blues at the Flamingo in 1964. It was later in that year that Fame heard and adapted "Yeh Yeh" for his sound. After three non-charting singles on Columbia, "Yeh Yeh" was released and went to number 1 in Britain for two weeks along with 21 in the U.S. Fame went on to have additional big hits with "Get Away" (1966 / #1 U.K. / #70 U.S.) and "The Ballad of Bonnie & Clyde" (1967 / #1 U.K. / #7 U.S.).